Exposure to radiation for long duration can have adverse effects on health such as skin burn, rashes and in severe cases may lead to development of cancer or tumor. The growth of the market is also expected to be influenced by increasing awareness about potential risks of operating radiation emitting medical equipment. Professional who work in imaging or diagnostic centers are required to take all the mandatory precautions to avoid exposure to harmful radiations. It is important to have sufficient medical radiation shielding in imaging and diagnostic facilities for protection of medical staff and people nearby. On the basis of product type, the blocks and rooms segment is expected to remain highly lucrative over 2022. Currently, the segment represents for close to 30% revenue share of the market and is expected reach a market valuation in excess of US$ 350 Mn by of the forecast period, expanding at a steady CAGR. This is mainly due to increasing importance of blocks and rooms for radiation shielding in hospital and diagnostic centers. Based on end use, the hospital segment is expected to retain its top position during the assessment period. In terms of revenue, the segment currently commands for close to 36% market share and is estimated to surpass a market valuation of US$ 400 Mn. In addition, the hospital segment is anticipated to create an absolute $ opportunity of US$ 67.9 Mn between 2017 and 2022. 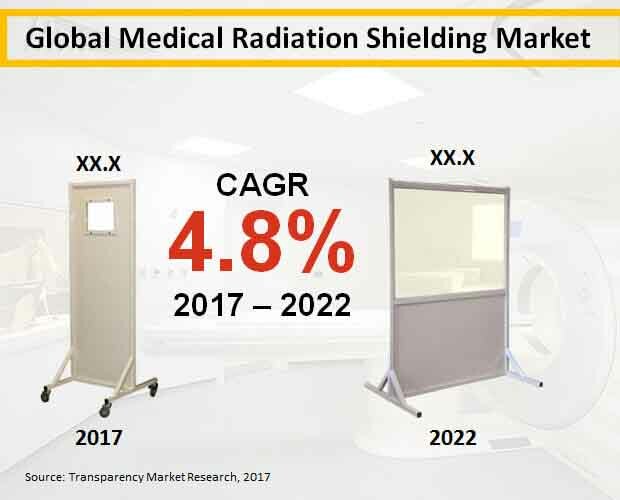 Demand for medical radiation shielding in diagnostic and oncology centers are also expected to grow in the foreseeable future. Based on solution, the diagnostic segment will continue to outperform the radiation therapy segment in 2017 and beyond. This segment currently accounts for more than 78% revenue share of the market is expected to stand at over US$ 900 Mn by 2022-end, exhibiting a CAGR of 5%. Among regions, the market in North America is anticipated to exhibit a steadfast growth during the projection period. North America’s medical radiation shielding market is expected reflect an above-average CAGR from 2017 to 2022. Due to existence of a leading-edge healthcare system, the region boasts potential growth opportunities for market players. The region is estimated to account for a significant share of the global market by 2022-end. Meanwhile, the markets in Europe and Asia Pacific excluding Japan (APEJ) are also expected to register health growth in the near future. ESCO Technologies Inc., Global Partners in Shielding, Inc., Ray-Bar Engineering Corp., A&L Shielding, Gaven Industries, Inc., Radiation Protection Products, Inc., and Veritas Medical Solutions LLC. are among the top companies operating in the global market for medical radiation shielding. Manu of these market participants are concentrating on enhancing the product efficiency and offer greater shielding from radiation.